New Solar energy farm starts generating clean energy in I.N. CURRIMAO, Ilocos Norte, Feb. 11 – Ilocos Norte maintains the trademark as the renewable energy capital of the Philippines. 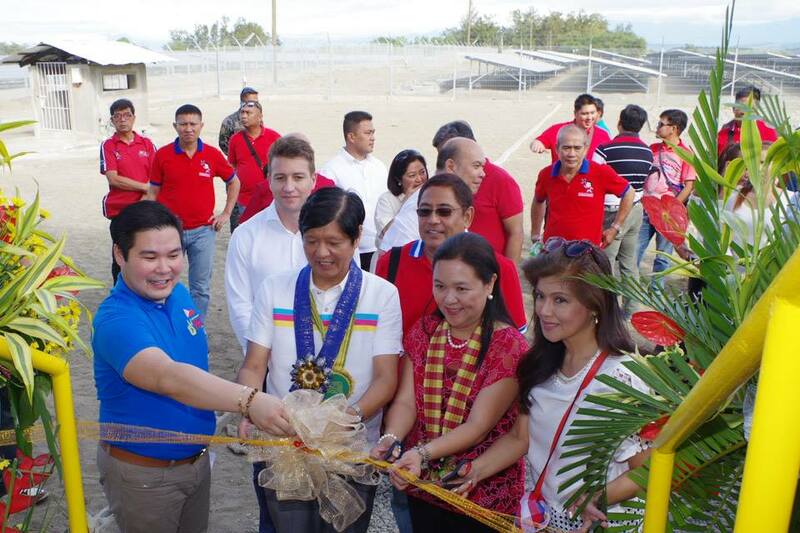 Last February 9, the 20 MW solar energy farm on a 60-hectare lot in Barangay Paguludan, this town was inaugurated. Vice Presidential bet Senator Ferdinand “Bongbong” Marcos, Jr. graced the facility’s inauguration rites after he kicked off his campaign sortie with his runningmate and presidential bet Senator Miriam Defensor-Santiago in the province. The solar facility, which is a joint project of the Department of Energy, the Ilocos Norte provincial government, Soleq Philippines Inc. and the Mirae Asia Energy Corporation, was developed through the partnership between San Lorenzo Ruiz Builders and Developers Group Inc. and Soleq, one of Southeast Asia’s largest independent solar utility generations. In a speech by Sen. Marcos, he reiterated the importance of “construction of more alternative sources of energy in sustaining power requirement for every Filipino household” as it won’t sacrifice the environment and reduces carbon emission. “This is something that Ilocos Norte should be proud of because we continue to reduce our environmental footprint through clean energy. And we will continue to support projects like this because this is our future and our children’s future are at stake here,” he added. The farm has at least 60,800 panels which can generate 30,000MWhour per year and can supply the power requirement for at least 29,328 households. Aside from the solar energy, Ilocos Norte is generating electricity through the windmills in Burgos, Bangui and Pagudpud and the mini-hydro-electric power plant of the Ilocos Norte Electric Cooperative (INEC) in Pagudpud. He said with the solar farm, Ilocos Norte is the only province which generates 50 percent of its power requirement from clean energy.